The Sacrament of Baptism is the first of the seven sacraments. The reception of the other sacraments depends on it. It is the first of the three Sacraments of Initiation, the other two being the Sacrament of Confirmation and the Sacrament of Holy Communion. Once baptized, a person becomes a member of the Church. Infant Baptism seminars are held four times a year. A team of parishioners and priests of the parish meet with the parents and sponsors who will be presenting the infants (under six years of age) for Baptism. The seminar takes place on a Friday evening and Saturday morning. The team members accompany the family through the preparation and then support them at the celebration of Baptism at the selected Sunday Mass. 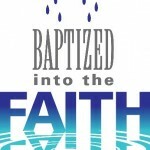 Baptisms are held on the first Sunday of every month excluding Lent. Children over the age of six are prepared for Baptism through the RCIA process. The liturgical life of the Church revolves around the sacraments, with the Eucharist at the center (National Directory for Catechesis, #35). At Mass, we are fed by the Word and nourished by the Body and Blood of Christ. We believe that the Risen Jesus is truly and substantially present in the Eucharist.